I’m excited to share my reveal for this month’s Secret Recipe Club! It usually takes me a couple weeks to decide on a recipe, because I always pick out way too many and then I need to narrow it down to that special one. This month was an exception! Upon receiving my assignment, Culinary Adventures with Camilla, Camilla is our group hostess and has so many unique recipes, things I’ve never heard of before. It’s so fun to see what she’s making the kitchen with her kids. She recently did 10 days of tailgating recipes – lots of great recipes over there! I searched for something using canned pumpkin. I had almost a full can after making pumpkin pie creamer and wanted to use it up before it went bad. 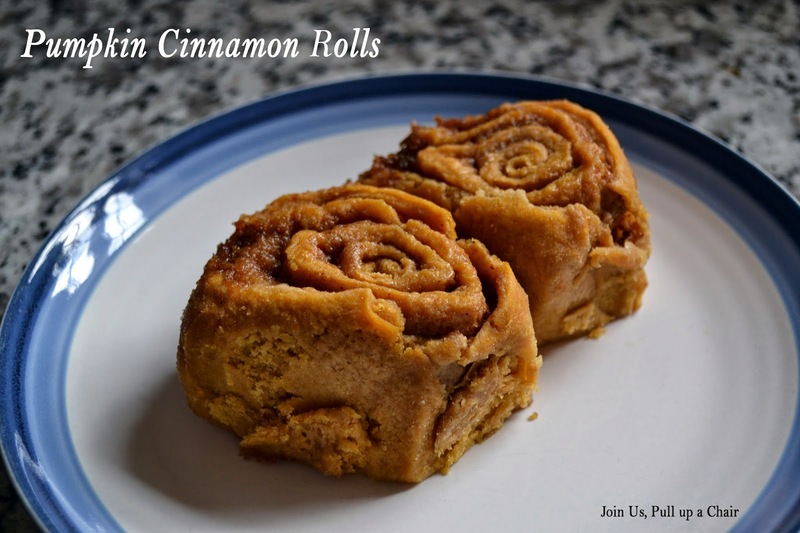 I found a recipe for pumpkin cinnamon rolls – SCORE! I’ve been wanting to make cinnamon rolls for awhile but hadn’t gotten around to it yet…so this was the perfect opportunity! The recipe was simple to make and was sooo good! The pumpkin flavor was perfect, with the ooey-gooey center. I tried them without any frosting, they were good..not too sweet, perfect for a breakfast treat. My husband decided to indulge and spread cream cheese over the top and dusted with powdered sugar. He loved it and said it was the perfect “bedtime” snack. Whether you enjoy them plain or with a little something extra, you definitely need to make this recipe! In a bowl of a stand mixer, combine the yeast, warm water and sugar. Stir and allow the yeast to bloom. After 3-5 minutes, stir in the pumpkin, flour and salt. Mix until a sticky dough forms. Knead the dough for another 4-5 minutes until it becomes very elastic. Place the dough in a clean bowl and cover with olive oil until it’s completely coated. Cover with a clean dish towel and allow to rise for 30 minutes. I used the proof function on my oven since it was cool in my kitchen when I made these. Butter and flour a round baking pan, set aside. Preheat oven to 375 degrees. After the dough has risen, cream together the butter, remaining two tablespoons of pumpkin puree, brown sugar, and pumpkin pie spice. Punch the dough down and transfer to a floured surface. Roll the dough into a large rectangle. Spread the pumpkin butter mixture over the dough with a off set spatula. Starting from the long side, roll the dough up and pinch the ends to seal everything in. Using a sharp knife, cut the log into 8 to 10 inch pieces, about 2 inches thick. Place the slices into the prepared pan. Bake for 15 to 20 minutes until the top and edges begin to turn golden brown. Remove from oven and allow to cool slightly before serving.